Like a lot of people who run marathon distance and beyond, I am often asked why I do it. Most races, usually around the halfway point, I ask myself this same question. Last night, as I nursed my quads home for the first time since the Brecon Beacons Ultra on Saturday, the answer came to me. The pain in my legs was noticeable, but it was a hurt having come from achieving something. I realised that, simply, nothing worth anything is pain free. Whether that is growing (or shrinking) a business, trying to get promoted, falling in love, having a baby, watching your partner have a baby, saving for that car you want, sacrificing holidays to buy a house, paying down debt, managing debt- I could go on and on. All of these involve pain and sacrifice in order to realise your goal. Everything that I want in life is potentially or almost unachievable. It is not guaranteed in any shape or form and I suppose I express this through running difficult events that push me. When I finish these events, I feel utterly drained but when I start to recover I have a renewed sense of accomplishment that I know I can use in day to day life. As an added bonus, I love running and spending time in beautiful parts of the world with really cool people who share the same passion as me. Nothing worth anything is pain free and I really felt that on Saturday. The Likeys Brecon Beacons Ultra is 47 ish miles over two course loops starting in the small Brecon village of Talybont-on-Usk. I arrived the night before the race and registered at the Likeys shop in Brecon before finally meeting Richard Fish, who was set to pace me at the North Downs Way 100 in August, before I dropped at the halfway point. This was the first time we had physically met and we were staying together in a great B&B two minutes from the start of the race. It turned out that the B&B was full of other runners and we all got on really well which made the weekend all the more enjoyable. Once at the start at 7:30am I got chatting to a number of people I have become friends with since getting into the sport. Dave Tilsley, John Hayden and Dan Park amongst lots of others I spoke briefly with. All three of these guys completed the NDW100 in August and I wanted to use this race to make amends for that day and re-build my confidence. The week before this race had been one of the busiest of my working life and I think I got to bed only once before midnight that week, on top of a lot of stress. I needed to have a long run in complete isolation, but was under no illusions that it would be fast. The first three or four miles are run along a meandering canal path before the first and toughest climb of the day. I took it really steady along the canal. My only goal was to try and remain consistent throughout the race and not have a fast first lap followed by a crawl around the second- which is more my style. Richard commented that he expected me to start a lot quicker, but I just wasn’t prepared to do that. It was great to be in a race with no expectations, no qualifying time needed and no one waiting for me at the end. I could be completely and utterly selfish in this race, which sometimes in life you just need to be. We came off the canal in around 35 minutes and formed a long queue over the first stile. Of 180 runners having started I would guess I was in about 100th place at this point. The climb up Tor Y Foel is long and steady. It is not back breaking but there are a number of false summits before you finally hit the real top. This was the 6th running of this race and I don’t think there has ever been more favourable weather for it. The views from the top were spectacular, a smattering of hill fog to make it all the more magical and views to lakes, forests and mountains in the distance. At the top I was with Dave and Jon, but decided to start jogging to stay warm as soon as I could. I got a shout of “What’s all this, then?” from Dave I think and I ran down the steep descent laughing trying to go as fast as gravity would allow. The main problem was my shoe choice. I had decided on my Pearl Izumi Trail N1’s which I bought back in April and fell in love with instantly. So much, that the tread had almost all worn away and I must have looked like I was in a pair of Heely’s or very small skis at times. How I didn’t fall down at least once I have no idea. I left skid marks all over the hill, which were almost as impressive as the ones Richard left back in our shared bathroom. At the bottom, it was on to a gravel road up to the first check point, which was about mile 7 I think. I was here in about an hour and a half and felt fine, so just topped up my water bottles and carried on down a steep muddy footpath to another fire road. This one gently bent through the woods but took an age. It was mentally tough as you could see so far ahead and I made a note that this would be an i-pod section second time around when everything would be harder. The road wasn’t hilly, but it wasn’t flat either, just a gentle sapping incline the whole way. I remember a quote from Scott Jurek’s book when he describes Spartathlon. There he said the road was never too steep to justify walking and “my only reason for walking would have been weakness”. So he ran. And I ran too using this to push me when I wanted a walk break. From here it was a short road section before the rocky path that led to The Gap. This was again a gentle incline but very uneven and ended up being a jog/walk/jog/walk section. During one walking break I noticed some soldiers coming towards us, so obviously kicked myself into a run as they passed me. The Brecon Beacons are home to the SAS and it was exciting to think I might have been witnessing the famous ‘Selection’. Within around 4 seconds of seeing these poor souls I realised they were in no way Special Forces. They looked like they had just been dropped off from prison and one or two looked close to passing out. I genuinely felt for them and I could see a few eyeing us runners up wondering why we were doing this for ‘fun’. At the top of The Gap, the descent was steep and really rocky. Hopping from boulder to boulder trying to keep the thought out of my head “If I go down here, I can kiss my teeth goodbye”. It wasn’t a hugely long section, but 16 or so miles in my legs were starting to feel it and I had to keep my feet high to avoid tripping. It soon levelled out and it was a lot more runnable down to the 17 mile aid station. From here it was the easiest six miles of roads, flat-ish fields, a few gates and then back to the canal for two or so miles to complete the loop and 23.5 miles done. I got here in 4 hours and 16 minutes and was now in 64th place. No one had passed me, but I had steadily overtaken around 30 or so. The second loop was exactly the same, but felt a lot further. The canal seemed to go on forever and I was all alone now and starting to question if I had missed the turn for the big ascent up Tor y Foel. I hadn’t, but it was nagging at me. As I climbed again, I could see people really starting to struggle. One guy had dropped and was puking with several others looking white as a sheet. It was much harder to get up having run a marathon already and I can’t imagine doing this race in much worse conditions. On the flats I kept up a rhythm which made me sweat. This meant on the long slow climbs when I was hiking I could feel my wet clothes sticking to me and I was shivering a little. Factor in snow and strong winds and it would be an entirely different race. With 180 people having already done loop one and 60 or so ahead of me on loop two, it was noticeably more churned up and I was slipping a lot more than loop one. 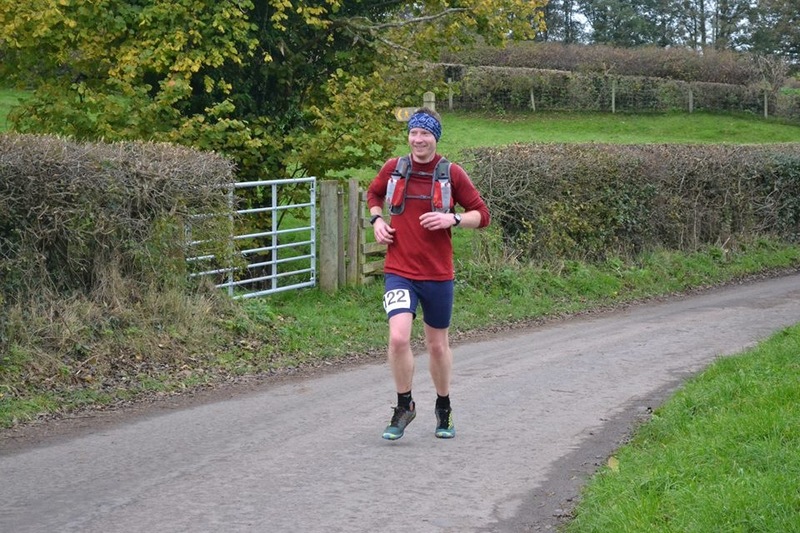 I tried to keep up the momentum and ran hard where I knew it was runnable and sensibly walked the more tricky sections. As it turned out, loop two was only 40 minutes slower than the first. After a strong first loop and good start to the second I knew I could push myself to not just finish, but get a good time. From mile 30 ish I was calculating what I needed to do to go sub 10 hours and this became my whole focus. Whilst three miles shorter than the North Downs Way 50, this had 3000 ft more of ascent, so I knew if I beat my 10:12 best from there in May this would be my best result to date. My sub 10 goal was based on hitting the final stretch of canal in nine hours. I hit the canal in 9:05 and knew I had to keep pushing. It was almost dark now and I had prepared on the last walking hill by putting on my headtorch. It would have been nice to finish without it, but in the end I only needed it for 20 minutes. As I hit the village and left the canal I was cheered in by Martin Like, the race organiser. He said “Just a mile and a quarter around the village and you’re done”. What? My brain didn’t properly register this and I won’t mention my reply once it did, where he laughed and said “its 300 yards down on your left and you’re finished!”. I crossed the line in 9:31 in 60th place. Without a doubt the toughest race I have yet done but one I put everything into and came away with a far better result than I had expected. I was only overtaken by two people during the whole race, but went past around 40 which proves I ran a calculated and controlled race…finally. Key to my strong run was a relaxed attitude for the first half and determination for the second half. But what I believe made this possible was finally having worked out a calorie schedule that works for me. I used solely Mule Bars and Mule Gels- two gels every hour and one bar per hour kept me going. Breaking it down like that made it more manageable than thinking I needed to ingest 18 gels and 9 bars during the run. I had no stomach issues and these will be my staple as I return to crack the 100 mile distance next year. The team at Likeys, the marshalls and everyone involved was fantastic. The race has a comfortable 15 hour cut off and whilst it would be tough as a first ultra, I can thoroughly recommend it and (I think) I will be back. My only suggestion to improve the race would be making the runners run the second loop in reverse formation. You would see the course from a whole different perspective and this wouldn’t change the logistics as the aid stations were fairly evenly placed. There are a few narrow sections, but 95% of the course there wouldn’t be congestion or collisions. Just remember if you do enter, that nothing worth anything is pain free. This race hurts, but it is a good hurt. In August 2011 I heard the term 'Ultramarathon' for the first time and have been obsessed ever since. I am not a race winner but hope to inspire as I have been inspired- I am by no means a natural athlete and if I can do it, anyone can. Having completed my first ultra in August 2012 I have just got started...and I am here for the journey. February- The Arc of Attrition.